When learning how to make barbeque sauce, you will find that these are used in several different ways. Some are used as marinades working as flavor enhancers, as well as tenderizers for backyard grilling, camp cooking or special events. Sauces can be used when cooking on grills, smokers or even in your kitchen oven. 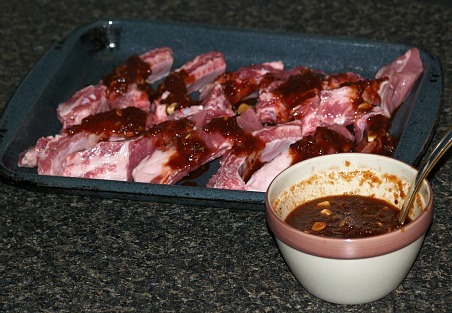 After the marinating process, the sauce can be discarded or it can be brought to a boil and served with the meat. I prefer the later if at all possible because I do not like to waste anything. These sauces can also be made only for a basting sauce used to baste meat while it is cooking. A long handled brush is used to apply the sauce frequently to bbq recipes, usually about every 10 minutes. For less tender cuts of meats like some of the steak cuts a marinade is usually poured over the meat and allowed to stand before cooking to let the tenderizing process work. If you are looking for how to make a barbeque sauce for this purpose, a well seasoned French dressing made with two parts of oil to one part vinegar works well for these meats. After refrigerating in the marinade for several hours or overnight, use the leftover sauce to baste the meat as it is cooking. You can also use this if you want to cook the meat in a pan; just brown the meat on both sides and then pour the sauce over the meat. Simmer until it is tender. After learning how to make barbeque sauce, no matter what your preference is, thick and rich sauces add delicious flavor to any outdoor cooking. Recipes with ingredients like tomatoes, savory garlic, onion and other spices capture the real homemade flavor and are a staple worth using often. To protect the bright colors of some of these recipes like the tomato based ones, timing for the application is very important. For steaks and chops apply to the meat after it has been turned the last time; about the last 3 minutes of grilling. Apply sauce to chicken in the last 10 minutes of cooking. For hot dogs and sausage add sauce the last 5 to 6 minutes. 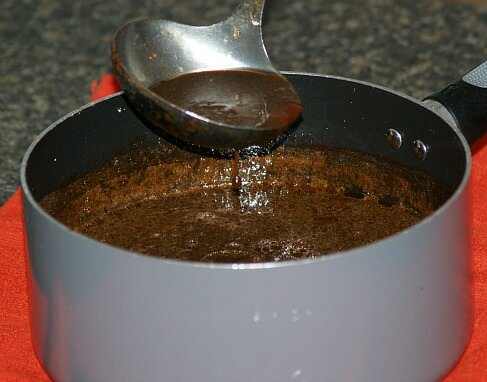 If you are cooking over indirect heat the sauce can be applied all during the last hour of cooking. When smoking meats add the last 30 to 45 minutes. If most of these sauces are added to early the result will be a burned exterior affecting the taste and presentation. Combine and blend all ingredients; Bring to a boil, reduce heat and simmer 1 hour. Brush on grilled chicken pieces. When you learn how to make barbeque sauce you will like this sweet, fruity flavor. Bring to a boil the vinegar and sugar in a small saucepan; stir in peel, ginger and thyme. Cook over medium heat until mixture is reduced to half; strain reserving sauce. Stir in remaining ingredients and cook until mixture is reduced to half; cool. Place mixture in blender, cover with lid and run until smooth; great served with pork. If you know how to make barbeque sauce you will enjoy this tasty mustard sauce. Place meat in shallow pan and pour mixture over top; refrigerate for 2 hours. Cook over indirect heat until done basting frequently. This is great for lamb. When learning how to make barbeque sauce, you will find that marinades work well on tougher cuts of meat, especially ones with an acidic base such as lemon juice. This lemon marinade recipe is good for tougher steaks like flank or top round. Combine all ingredients in a small bowl and blend. Place meat in a plastic bag or in a shallow dish; cover with 2 medium sliced onions. Pour sauce over meat and onions; seal tightly and marinate 2 hours at room temperature or overnight in refrigerator. Cook on grill 8 to 12 minutes on each side until desired doneness. While cooking steak, melt 2 tablespoons butter in large pan over fire; add drained onions and sauté until tender. Cut steak across the grain in thin slices and top with onions to serve. When learning how to make barbeque sauce, you will find that some unusual ingredients help to add to the great flavor of your sauce. Many believe this coffee barbeque sauce is the very best sauce for grilling with the addition of very strong coffee. Combine all ingredients in a heavy pot; bring to a boil over medium low heat. Cook stirring frequently for at least 30 minutes; baste meat with a brush during cooking.